The debt-ridden farmers want the government to waive off their loans and want the right to fix the price of their own produce. “We are trapped in the vicious cycle of debt,” they said. 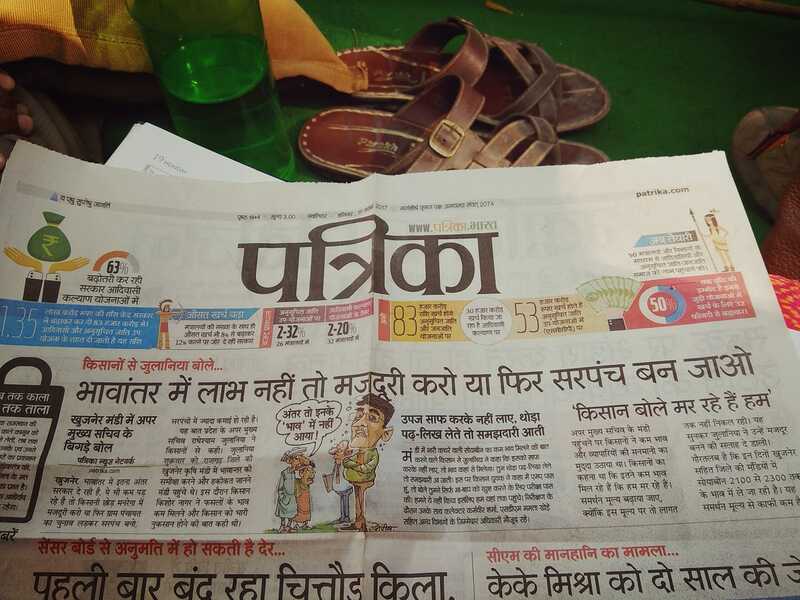 "It has become clear what the Government has planned for us," said Rajeev Dixit, a farmer from Chambalghati, MP as he fished out a crumpled piece of newspaper from his pocket. The news article from a local newspaper of MP, said that the IAS and “upper mukhya sachiv” Radheshyam Jaulaniya went to Khujner mandi and told the farmers that if they don’t like “Bhavantar” scheme, if they don’t feel that the farmer is getting fair price under Bhavantar then they should become “majdoors” (labourers), work under MNREGA, give up their farms, become daily wage labourers. The farmers are appalled that when they went to speak to Jaulaniya about their problems and issues of not getting a fair price for their produce, he asked them to leave their profession. “Elected representatives of the Government are openly asking the farmers to leave their farms. Their intentions are clear, they want to feed our lands to the corporates, the very farmers who feed the nation have become a liability for them,” he said. Rajeev Dixit believes that the Government is actually working towards this goal of stripping the farmers off their land and their livelihoods. The CM of MP, Shivraj Singh Chauhan has announced the Bhavantar scheme which covers 8 crops namely soya bean, maize, til, ram til, moongfalli, urad, moong, arhar. According to this scheme, the price of these crops will be fixed by the government at the average market price at which these crops sell in the mandis of Madhya Pradesh and two neighbouring states i.e. Rajasthan and Maharashtra. The farmers inform us that, the main crop that has been growing in MP, right from Bhind Morena, Gwalior to Chambal Ghati is Bajra, which has not been covered under Bhavantar. They say that they revolted against Bhavantar and this decision to not include Bajra but Shivraj Singh Chauhan has said that if anyone raises their voice against Bhavantar will be picked up by the police and thrown into jail. This is an outright violation of democratic and constitutional rights. Bajra is grown extensively in MP has not been included under Bhavantar while til etc which is rarely grown in MP has been put under the Bhavantar scheme. Under the Bhavantar scheme once the price of the produce is fixed at the average market price between the three states, then the produce will have to be sold to the traders at this price in the mandis and if the market price of any of these produces is more than that the Bhavantar price then the difference amount will be credited to the farmer’s bank account after 2 months. So basically the Bhavantar price will be lesser than the previous market price for some produce. This is a bizarre scheme which clearly aims at benefitting the traders rather than the farmers and the farmers feel that there is a covert understanding between the government and the capitalists and big traders of profit to capitalists at the cost of the farmers. Also, so far no credit has been made to the farmers' accounts against the price difference between Bhavantar price and market price of a produce. Now let us take the example of “til” or sesame, Sesame has a minimum support price (MSP) as determined by the central government at Rs 5000/quintal but in the mandis, sesame sells for 6500/quintal, an average of 1500 per quintal more than MSP. These crops which were fetching such a good market price need not have been put under Bhavantar, while Bajra which fetches 800/quintal in the market and has an MSP of Rs.1425/quintal has not been included under Bhavantar. Moreover, because the crops under Bhavantar are now selling at a lesser price, the selling price of bajra has further reduced in the markets. Not only is the government not giving the farmers a fair price, they are deliberately reducing the prices that they were getting in the market for their produce and if they raise their voices, their voices are being crushed. In Mandsaur, six farmers were killed, their bodies riddled with bullets. 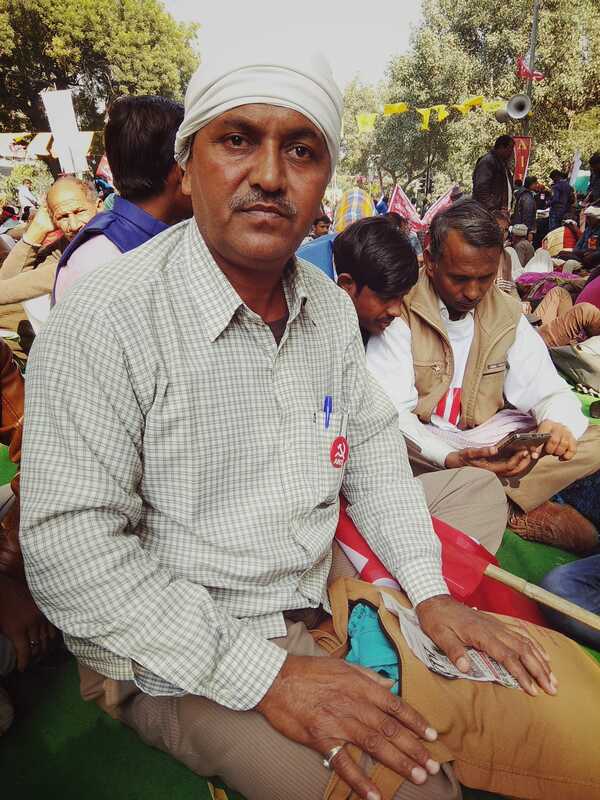 “We have come to Delhi to ask for our rights, we are not asking for handouts. We are here to ask the government to free us from our debt, if the government can write off lakhs of crores of loans of the rich capitalists, can they not waive Rupees one lakh loan of each farmer? If the corporates, the capitalists can decide on the price of their products, why do we not have the right to fix the price of our produce, why is the government telling us at what price we should sell our produce. The government is fooling us with schemes like Bhavantar, they want us to give up farming, they want to hand over our land, our fields to corporates, they want to beggar us, turn us into daily wage labourers, we will not let that happen,” they roared.